White, too, has argued that “the fundamental analytical mistake has been to model the economy as an understandable and controllable machine rather than as a complex, adaptive system,” and Lewitt certainly concurs. Understanding what to look for requires the proper intellectual frame of reference, which Mr. White correctly argues requires an understanding of complex systems, which require digital not analogue and non-linear rather than linear thinking. The global economy lacks a common anchor of value, leading the value of all financial instruments to be based on a structure of reference rather than relation; in other words, assets are valued based not on their inherent characteristics but on their relative worth compared to other assets. Well, in the first place, what the heck does it mean to engage in “digital not analogue” thinking? How exactly is digital thinking more nonlinear or better aligned with complexity? What I suspect is going on here is that all of us – Lewitt, White, me, and many others – are just beginning to come to terms with this complexity business. We start to talk about it, and then two seconds later we’re using same tired old economics language we have used for decades. It’s the only language we have! Complexity economics, at this stage, is just very fancy algorithms in very fast computers; it’s not something we can fruitfully chew over and do anything with in our daily work as analysts and investors. But we’ll get there, and that’s why I’m sharing this piece with you today. I hope you’ll read it, mull it over, and get back to me about it. Let’s share other resources on complexity economics and figure out together how to put it to work. This week, I find myself deep in the jungle of trying to figure out what the new federal tax policy will be. My fellow explorer Patrick Watson and I have been on numerous conference calls with various people, most of whom are willing to provide background but not actual quotes, although Congressman Kevin Brady (of Texas), the chair of Ways and Means, the House committee where all tax bills must originate, was gracious enough to go on the record. To say this bill is complex is an understatement. It touches EVERYTHING. I have been in jungles on several continents. Let me just say that this tax jungle is not as breathtakingly inspiring as the Amazon jungle. Several things actually. The whole idea is to create jobs, which no one can be against, but what jobs and where? Rather than do the “reveal” on these thorny questions today, they will be the topic of this week’s letter, coming to your inbox over the weekend. The whole jobs question is a big part of my thinking in “The Future of Work,” which I keep saying has been the most difficult chapter to write in my upcoming book on the next 20 years. Are we conservatives like the generals who are always planning to fight the last war? Or are positive human responses to proper incentives part of our core DNA, so that getting the incentives right will work? Are we fighting the future, or making it? Big questions. They are giving me the signal to get ready to go on stage, so I will hit the send button. Shane and I are throwing a Super Bowl party on Sunday and I will simply say that I want to see a good game that is close, talk with friends and family, and enjoy my chili and Shane's beans and some of the best BBQ in Dallas – and of course guacamole. No diets on Super Bowl Sunday. Have a great week. William White is one of the few policymakers who foresaw the 2008 financial crisis. Understanding the pathologies that led to the global financial crisis, Mr. White today rejects the intellectual errors that mislead so many mainstream economists, pundits and officials regarding the current state of the global economy. In a recent speech, he criticized consensus economic thinking and warned that, for all the hoopla surrounding Donald Trump’s ascension to the presidency, insufficient attention is paid to the precarious state of global finances. Mr. White argued that “the fundamental analytical mistake has been to model the economy as an understandable and controllable machine rather than as a complex, adaptive system.” As a result, the decision to solve a debt crisis by printing tens of trillions of dollars more debt2 means that “the situation we face in late 2016, both in the advanced economics (AMEs) and the emerging market economies (EMEs), is arguably more fraught with danger than was the case when the crisis first began.” He added, “(b)roadly speaking, the levels of prices in financial markets today look as stretched as they did in 2007 just before the crisis erupted.” The global economy is much more leveraged today, central banks’ are running out of policy responses, and the geopolitical landscape is more stressed than at any time since the end of the Second World War. I would go further than Mr. White’s warning, however; global bond markets are in an epic bubble and stock markets are quickly catching up. The failure to recognize markets as complex systems led policymakers to adopt the wrong approach to healing the global economy after the crisis. Giving credence to the adage that a hammer views every problem like a nail, they clung to the misguided belief that “growth and job creation deemed to be inadequate are solely due to inadequate demand and that this can always be remedied with expansionary monetary policy.” This is the wrong lesson gleaned from reading John Maynard Keynes though certainly the most politically palatable one since monetary stimulus delays the necessary (and painful) cleansing of excesses that economies require to move forward. Policymakers also developed an excessive fear of deflation and failed to distinguish between deflation caused by positive factors such as higher productivity and technological innovation, on the one hand, and deflation caused by too much debt suppressing economic growth and ultimately inflating asset values beyond sustainable levels on the other hand, such as the type we saw during the financial crisis. 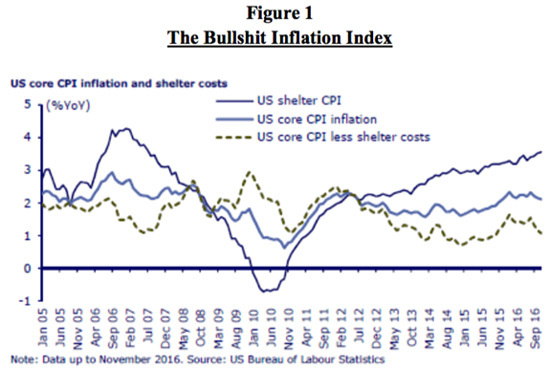 As a result, any time they see low inflation (as they measure it, which has little relationship to reality), they expand credit with little regard for the consequences. The result is an increasingly over-leveraged economy whose growth prospects are suppressed by the very debt- driven policies employed to stimulate economic growth. The question that all market observers ultimately have to answer today is whether the epic accumulation of global debt is sustainable. If it is not, as I believe, the next question is how to identify the signs indicating that excesses are becoming unsustainable and leading to breakage. Understanding what to look for requires the proper intellectual frame of reference, which Mr. White correctly argues requires an understanding of complex systems, which require digital not analogue and non-linear rather than linear thinking. The global economy lacks a common anchor of value, leading the value of all financial instruments to be based on a structure of reference rather than relation; in other words, assets are valued based not on their inherent characteristics but on their relative worth compared to other assets. This is what gave rise to a $600 trillion derivatives infrastructure that prices the risk of all types of financial instruments based on binary contracts between counterparties rather than reference to any independently verifiable indicia of value (and also requires the ability of contracting parties to perform their obligations). It also divorces market values from fundamental economic values based on the inherent qualities of financial instruments. Complex systems are also self-adaptive, which means they are capable of adjusting to changing conditions. But these adjustments are often sudden and violent and systems don’t return to their previous state, leaving those trying to manage them with a new reality for which old models and modes of thinking are inadequate. This is precisely what happened after the 2008 financial crisis, when policymakers were left facing a much more leveraged world but failed to adapt their tools to new conditions. Whether the global economy is capable of adapting to an unsustainable state of over-indebtedness is dubious; the only question is the timing and severity of the coming adjustment. As Mr. White warns, we risk learning the answers to those questions before we are prepared to withstand the consequences. As we are reminded every time we look in the mirror of our automobile, objects are closer than they appear. In this case, the forces destabilizing financial markets and rendering them fragile and vulnerable to another crisis are staring us right in the face. But in order to see them, we have to learn to see markets for the complex and unpredictable systems they are. Markets are chasing the highest valuations in history. And as usual, they are cheered on by an increasingly puerile mainstream media. Barron’s didn’t even wait for the ink to dry on the Dow Jones Industrial Average’s 20,000 print before declaring in a new cover story: “Next Stop Dow 30,000.” Barron’s argues that “[t]he Dow hitting 20,000 was no fluke. Today’s stock prices are well supported by corporate earnings and economic growth. In fact, if President Trump can avoid stumbling into a trade war – or a real war – the Dow could surpass 30,000 by the year 2025.” Leaving aside that this National Enquirer-style headline is a desperate attempt to pump up readership and is followed by an article lacking a modicum of analytical substance, let’s take a serious look at claims that corporate earnings and the economy are strong. The facts tell a different story than the one Barron’s tries to sell. Corporate earnings have been weak for the last two years. According to Factset, estimated non- GAAP earnings growth for S&P companies in 2016 was a paltry +0.1% (and GAAP earnings growth was negative). Revenues were up roughly 2.0%, which is zero growth once you back out phony government inflation data and negative if you use real world prices. In 2015, S&P 500 earnings declined year-over- year on both a GAAP and non-GAAP basis. But even these figures really don’t tell how poorly businesses are performing because GAAP and non-GAAP earnings are inflated by low effective corporate tax rates, low interest rates on the money borrowed to buy back stock and pay higher dividends, and sluggish wage growth. US corporations are significantly more leveraged than they were on the cusp of the financial crisis in 2007, a condition disguised by record low interest rates that are now rising. So-called non-GAAP S&P 500 earnings (which are best considered “earnings as we would like them to be” rather than as they actually are) are more than $20 per share higher than GAAP earnings. With almost half of companies reporting so far for 4Q16, the full year estimate for 2016 S&P 500 non-GAAP earnings is $108.66 and GAAP earnings is $97.98 This puts the market multiple at 21.1x trailing non-GAAP earnings and 23.4x GAAP earnings.4 By way of comparison, this multiple was 24x non-GAAP earnings during the Internet Bubble. Other valuation metrics such as the Shiller Cyclically-Adjusted P/E at 28.4x (versus a mean of 16.7x) and the S&P Market Cap/GDP Ratio of 125% are also at extreme levels. There are other signs of excess as well such as margin debt running above $500 billion compared to $380 billion at the market top in 2007. Wall Street strategists trying to tempt investors into buying more stocks at these levels are playing with fire. And Dow 20,000 isn’t what it seems. Drawing historical comparisons between index levels is an inexact science due to the fact that the composition of these indices changes over time. The composition of the Dow Jones Industrial Average has changed over time. As economist extraordinaire David Rosenberg points out, if the eight companies that were replaced in the Dow since April 2004 had remained in the index, we would be reading about Dow 12,886, not Dow 20,000.5 Also, as a price-weighted index, moves in certain stocks have an outsized impact on the Dow, creating false impressions about the overall strength of the market. For example, moves in Goldman Sachs Group (GS) have eight times the impact on the Dow as those of General Electric (GE), a factor that contributed to the index’s post-election rally. Tracking the Dow may make for good financial television (actually, nothing makes for good financial television today other than Realvision TV, but that’s a topic for another day), but it is comparing apples and oranges and means little analytically. All Dow 20,000 accomplishes is getting investors all stirred up that they are missing a rally. They should be careful what they wish for. 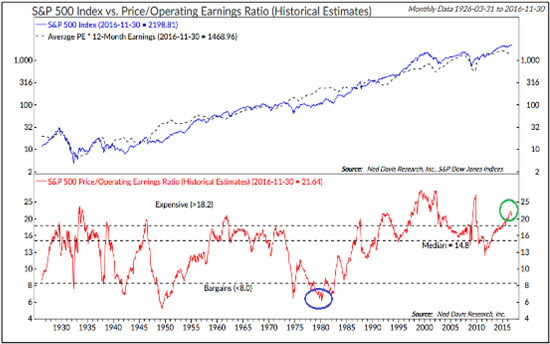 The chase to peak valuations is occurring in a weak economy. Barron’s claim that economic growth justifies not only Dow 20,000 today but Dow 30,000 in eight year is malarkey. Barron’s ignores the fact that fourth quarter GDP sputtered to 1.9% and kept full year 2016 growth at a disappointing 1.6%, the slowest since 2011 and down sharply from 2015’s 2.6% pace. Last year marked the 11th consecutive year that America failed to reach 3% growth, the longest period since the Bureau of Economic Analysis started reporting GDP. U.S. industrial production has declined on a year-over-year basis for 15 consecutive months and the capacity utilization rate is a disappointing 75% (a level considered contractionary). And let us not forget that this tepid growth was boosted by eight years of zero interest rates and trillions of dollars of QE; without that support, the economy likely would have shrunk. Claiming that robust economic growth supports higher stock prices is nonsense. Stock prices are primarily supported by cheap money and, as we will see in a moment, important structural forces in the markets. Stocks enjoyed quite a run since Election Day. But even before Donald Trump surprised the world and won the U.S. presidency, stocks were on an epic run that began in March 2009 at the depths of the Great Financial Crisis. The most impressive aspect of this bull market is that it defied the worst economic recovery in the last century and survived eight years of Obama administration policies that were hostile to economic growth and markets.6 As noted above, rather than based on a solid economic foundation, the bull market benefitted from zero interest rates, lower corporate tax payments, wage suppression and financial engineering in the form of epic levels of debt-funded M&A, stock buybacks and dividend increases. These factors have little to do with the fundamental financial condition of American corporations (in fact, some of these factors weaken their condition). Eight years later, this leaves the markets (and the individual companies comprising them) overvalued and overindebted. But the important question for investors is not where the market has been but where it is going. Right now, it would be imprudent to fight the sentiment pushing stock prices higher. Donald Trump’s presidency represents a sharp break not only with the awful Obama years but the Bush II administration as well. The new president is laying waste to decades of failing domestic and foreign policies. It is hardly surprising that investors are willing to ignore serious structural impediments to growth in order to give the new president the benefit of the doubt. This sentiment will likely calm down once the realities of governing within the American constitutional system set in, but for the moment fighting the tape is a tough gig. There are also important structural forces pushing stock prices higher without regard to fundamentals. The question the market will have to answer is whether the serious valuation, growth and debt headwinds facing stocks are more powerful than these structural forces that developed over the past two decades that contributed to stock prices trading today near their highest valuations of the century. The most powerful structural force at work is an unprecedented amount of money pursuing a diminishing number of U.S. stocks. There are roughly half as many publicly listed companies trading on U.S. stock exchanges today than 20 years ago. The peak of 7,322 public stocks was reached in 1996; by late 2015 the number was down to 3,700.7 The primary reason for the decline is massive M&A activity that removed many public companies from the mix; lesser reasons include the cumulative effects of private equity firms buying public companies (a subset of the M&A boom) and a steady slowing of IP0 activity. Heavier regulation such as the Sarbanes-Oxley Act passed in the wake of the Enron scandal significantly increased the costs of being a public company and contributed to more companies staying private. All of these factors caused the number of publicly listed companies to shrink significantly over the last twenty years. While the number of listed companies dropped sharply, thousands of new ETFs sprang up to take their place. But ETFs do not create new investment opportunities; they merely repackage existing ones. As a result, they magnify the shrinkage of available stocks by funneling more money into the limited number available. Stocks included in the most popular and largest ETFs attract more capital than those excluded from such ETFs without regard to their investment fundamentals. This inflates their values beyond what fundamentals justify. This is how the market became as overvalued market as it is today. And it is also how markets can stay overvalued for long periods of time. But this is only half of the picture. The other half involves the fact that there is much more money in the world today chasing this diminishing number of investment opportunities. While the number of stocks dropped in half over the last twenty years, the global stock of money available to invest in them exploded as a result of unprecedented efforts by central bankers to revive economic growth. These efforts accelerated after the 2008 financial crisis to the point where the world is now home to more than $200 trillion of debt. In addition, there are tens of trillions of dollars of equity on top of this figure to bring the total stock of money to somewhere in the $250 trillion range (my very rough estimate). Obviously all of this money is not chasing equities, but the world is flooded with capital seeking a positive return, a challenge exacerbated by the imposition of historically low interest rates by central banks. With bonds reduced to certificates of confiscation that guarantee negative real returns for years to come, money is naturally drawn to stocks that at least offer the chance of higher returns. While a more economically enlightened policy environment may offer a reasonable basis for buying stocks, more money chasing fewer stocks is arguably a more powerful force. Even if U.S. stocks struggle with higher interest rates and a strong dollar under the new administration, the gravitational pull of tens of trillions of dollars of capital looking for decent returns within a shrinking pool of stocks may make it much more difficult for a sharp sell-off to occur, certainly one that would last very long before all that money would come back into the market looking for “bargains.” This is particularly true in a world where investors are trained to buy on dips like Pavlov’s dogs. Right now, the biggest danger to stocks appears to be higher interest rates. Most observers (at least the ones I respect) put the danger zone at the 10-year Treasury hitting 3%. I actually think the yield could hit 3.25-3.5% without sinking stocks if higher rates are seen as a sign of better economic growth. The Fed is telling people it plans to raise rates three times in 2017, an aggressive stance to which it is unlikely to stand up. But even 50 basis points of hikes before year end (my expectation) would push 10-year yields to 3% (assuming the curve doesn’t flatten or invert due to recession) and closer to the day of reckoning. With American corporations carrying more debt than ever before, higher rates should worry investors. But until rates hit the danger zone, the enormous amounts of money chasing a diminishing number of stocks will remain a strong force supporting the market. That doesn’t mean stocks are guaranteed to produce positive returns in 2017, just that the odds of anything worse than a garden variety bear market (down 10%) are limited. Further, all that money chasing the limited number of stocks would likely render any bear market short-lived. This also doesn’t mean a lot of stocks won’t go down – there are many lousy companies trading at unsustainable levels. But it remains a stock picker’s market on both the long and short sides. There is little question that Donald Trump’s presidency introduces an unusual degree of uncertainty into markets. The fact that liberals purport to be shocked that Mr. Trump is fulfilling his campaign promises confirms their cynicism and inauthenticity. The Trump administration represents a sharp break not only with the disastrous domestic and foreign policies of the Obama years but the failures of the Bush II administration. Mr. Trump is an ideological hybrid, borrowing ideas from both progressives on trade and foreign policy and conservatives on the economy, the Supreme Court and social issues like abortion and gun control. He is uniquely positioned to run against both establishment political parties and, most important, to take aim at the entrenched and corrupt government bureaucracy. He is considered unpredictable but in fact he is quite the opposite: he does what he says and he says what he does. If this is considered unpredictable, it is only because recent presidential candidates misrepresented their true colors (Obama and Bush II campaigned as moderates but governed from the far left and far right, respectively). The unhinged reaction of the mainstream media, which Mr. Trump correctly describes as corrupt and dishonest, only confirms their attempt to disguise rank political partisanship behind a phony First Amendment curtain. The fact that so many of the so-called journalists who were actually working behind the scenes for Hillary Clinton and writing false stories about Mr. Trump and the election are still on the job is inexcusable (when, for example, is CNBC going to fire John Harwood?). I certainly do not agree with everything Mr. Trump says or does (though I agree with much of it), but at least he speaks his mind and backs it up with action. Our country is now run by generals and businessmen, not by the types of academics and politicians who made a shambles of foreign and domestic policy over the last two decades. Before we judge Mr. Trump too harshly, we should give him a chance to implement the policies that he was elected to implement. The fact that a biased liberal media and half the country doesn’t like him or his policies is irrelevant. By the time Mr. Trump’s first term is over, the media is going to be a shadow of its former self if it doesn’t start telling the truth and behaving like the Founders envisioned, not like a bunch of political operatives. 1 William R. White, “Ultra-Easy Money: Digging the Hole Deeper,” Adam Smith Priwe Lecture, National Association for Business Economics, Atlanta, Georgia, September 11, 2016, http://www.williamwhite.ca/content/ultra-easy- money-digging-hole-deeper. I strongly recommend this paper as a balanced and sobering analysis of the current state of the global economy from one of the smartest and most well-informed policymakers in the world. 2 Friedrich Hayek famously warned that, “To combat the depression by a forced credit expansion is to attempt to cure the evil by the very means which brought it about.” Friedrich A. Hayek, Monetary Theory and the Trade Cycle, Martino Fine Books, 1933, p. 21. 3 The work of Nassim Nicholas Taleb speaks to the tendency for systems to become unstable (he uses the word “fragile”) based on human failures to think properly about them. See Nassim Nicholas Taleb, Antifragile: Things That Gain From Disorder, New York, Random House, 2012. On complex systems, see also Marten Scheffer, Critical Transitions in Nature and Society, Princeton, Princeton University Press, 2009. 4 Peter Boockvar points out that non-GAAP earnings grew by 10.7% in the last four years beginning in 2013 while the market multiple expanded by 47% (from 14.4x non-GAAP and 15.9x GAAP earnings in 2013). The reason for this is that central banks reduced the price of money to zero through QE and ZIRP (zero interest rate policy), radically affecting the discount rate used to calculate the price at which equities “should” trade. Rather than being supported by earnings, stock prices are levitated by cheap money and an absence of intellect on the part of investors. Money is becoming less cheap but investors are not becoming smarter, a potentially deadly combination. 5 David Rosenberg, Gluskin Sheff, Weekly Buffet with Dave, January 27, 2017, p. 13. The eight companies dropped from the Dow and their successors are Alcoa/Nike (2013), Altria Group/Chevron (2008), AIG/Kraft Foods (2008), Citigroup/Travelers (2009), General Motors/Cisco Systems (2009), Hewlett-Packard/Visa (2013), Honeywell International/Bank of America (2008), and SBC Communications/Apple (2005). 6 While nobody should be surprised that Barack Obama never saw 3% GDP growth during his tenure as the economy recovered from a serious financial crisis, his policies made things worse than they needed to be. Rather than prioritize economic growth, he pursued policies to more heavily regulate the economy and redistribute income. In doing so, he failed to help the very disenfranchised constituencies that voted for him and that he claimed to champion because he failed to understand the devastating effects of activist monetary policy and refused to promote pro-growth fiscal policies. While Mr. Obama will no doubt blame George W. Bush and Republicans for his failures, the blame lies with him. 7 Craig Doidge, Andrew Karolyi and Rene M. Stulz, “The U.S. Listing Gap,” NBER Working Paper No. 21181, May 2015. Feb. 13, 2017, 2:46 p.m. Yes, there are “more dollars chasing fewer stocks” due to M&A activity. However, there are prices attached to those “fewer stocks”. If company A acquires company B, the value of company B doesn’t magically disappear. It’s priced in, which means those “more dollars” are now chasing “higher prices” due to the fact that two companies merged into one. For example, if Apple acquired Google, Google’s value isn’t going to magically disappear just because you can no longer invest in Google stock. Feb. 5, 2017, 11:29 a.m. This is great stuff from Mauldin. He refers to the Gilder explanation of the economy as an information system, which is by far the best explanation of our economy I have read to date. We need to spend less time defending economic models and more time collecting and dealing with the hard data and making more rapid adjustments to policy. Feb. 4, 2017, 4:41 a.m.
A few thoughts about complex adaptive systems as applied to the economy. In principle we could model the economy; in practice we can’t because as noted by Britelli above we can’t get enough information to do so. But I think it’s important to look at why that is because it can provide some useful insights. The economy is a group of intersecting networks of economic actors tied together with a mixture of strong and weak links. These links serve two purposes - passing information and passing resources (i.e., money won’t flow where messages don’t go!). What makes this an adaptive system is that it can learn, i.e., that it has ways of sensing that something has changed, passes that information around the network(s), and then alters the system’s structure to either avoid pain or maximize gain from the change. Thus, to model the economy we have to know all of the players, all of the links (system structure) and their strengths, what each player can sense, all of their biases built into interpretation of what they sense, and so on. We make simplifying assumptions. For example, the rational investor assumptions which drastically reduce the complexity of the system. No concern about linkages or biases or sensors so all you need to do is get the players right. A more useful assumption (particularly for big shocks to the system) is what I call “Disasters have direction.” We know that most big shocks can be thought of as having an initial “point of attack” on the system. A housing bubble bursting will initially hit the residential market and then cascade to home builders, building materials suppliers and so on. What this suggests is that another way to approach economic modeling is to run scenarios with various “surprises” and look for the cascading consequences. Is there a way to insulate the rest of the economy from a given shock? What are the signals we should be looking for? And so on. One thing that immediately comes out of this is the importance of correlation (= connectedness), both for risk and recovery. Risk - high correlation means that shocks to one part of the system are more easily translated throughout the system. Thus, government intrusion into all aspects of the economy (e.g., the ACA) increases the correlation among these aspects, i.e., means that a shock to one is more likely to be felt by all, i.e., lower firewalls. Recovery - conversely high correlation means that resources are more likely to be passed to repair the damage. Of course, here’s one place where biases become important - as we saw with Mr. Obama’s stimulus, political considerations badly biased where the money went. Feb. 3, 2017, 9:27 p.m.
Fabulous article by Lewitt. He sees reality but markets can remain irrational for a lot longer. One either tries to follow the trend or to use a rational true value approach as Buffett and Graham and Dodd used, which requires allocation changes (scaling out of equities and bonds) in an environment as we see now.